For the last decade, I have been working on a document called Procedures and Techniques. It has it’s genesis in what was originally a Common Errors document based on observations of Pilot/Student actions in the Simulator – but most particularly Instructor/Examiner activity in the Brief/Sim/Debrief as well. Over the years this document has grown. It’s morphed from a document that purely adds to what Boeing say in the FCOM/FCTM (and elsewhere); to a document that explains what Boeing (likely) intend in the FCOM/FCTM, and how that works in the Simulator and in the Aircraft during Airline Operations. It details and explains Procedures; describes Techniques – but more than this it seeks to raise levels of understanding about why we do certain things the way do – or do not do certain things. While I wrote it for my Airline, our Instructors, our Pilots – much of the content is universally relevant to all 777 operations – and wider. I’ve been fascinated where it’s turned up. At one point I needed some kind of simulation software on my PC to make training material. I discovered PMDG’s excellent B777-200/300 product and Rockwell Collins excellent Prepar3D. 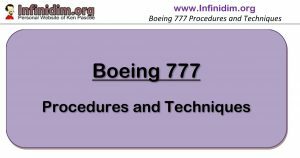 While wandering around the PMDG B777 forum I was fascinated to discover that most of the avid B777 simmers were referring to a 2011 copy of Procedures and Techniques when trying to add real-airline realism to their hobby. I’ve spent the past several weeks combing through, reviewing the content and removing identifying references to my own (or any) airline. That said – the essence of this document is my voice to our pilots and instructors, so I hope you find the content speaks to you as well. You can now download this revised document from the front page of Infinidim.org – it’s on the top RHS under Procedures and Techniques – with the most recent update (date) indicated. Moving forwards, there will be a clean version, as well as one with yellow highlighting (HL) to indicate significant changes. I’m always looking for topics of interest to research and write about – the section of on Cold Temperatures Corrections came after a particularly interesting query from Air France. So if you have any suggestions for content, please get in contact.